Games and pastimes in great variety afforded relief from the oppression of the kapus and from the work necessary for everyday living. Each district had its kahua or field where great sports tournaments (ho’ok ?k?) were held. Here the multitudes watched their champions match their skill and strength in such sports as boxing and wrestling. Quieter pastimes amused the people far into the night. In some districts the sea was ideal for surfing, diving or canoe racing. The slope of some hills provided courses for the chiefs’ holua sleds or the ti-leaf slides of the commoners. The four month period known as the Makahiki was an annual holiday season dedicated to Lono-i-ka-Makahiti, god of sports. During this season most of the work ceased, wars stopped, the people paid their taxes to their chiefs, then played games and danced. Early visitors to Hawaii wrote of being spectators at tournaments or demonstrations and praised the players for their vigor, their bravery and good humor. Much that is known about the important sports was recorded during the early years, since most of these games were discontinued within twenty years after the overthrow of the kapus and the acceptance of introduced ways. The decline of the native sports was caused by a number of factors. The Hawaiian people were so intensely interested in the new culture of the foreigners that they neglected their games in order to earn money to purchase introduced articles. Introduced sports and pastimes were accepted and replaced most of the native games. The chiefs no longer maintained their “courts” where young men played games for the entertainment of their elders and as training for Hawaiian warfare. The betting that accompanied the old games met with the intense disfavor of the missionaries. The most satisfactory way to discourage gambling was to discourage the games. This old Hawaiian games tests the strength of your leg muscles. A referee for each pair. Each player sits facing his partner. They sit far enough apart so that their knees are slightly bent. The toes and balls of their feet should touch each other. Their hands should be flat behind them. Their arms should be straight. This will hold their bodies in position. Each player pushes his feet against the other player's feet. A player can push straight ahead so that the other player is moved backwards. Or he can try to push the other player's feet to the right or left side. A player wins if he moves his partner away from him or out of his sitting position. Hawaiians of long ago played this game to develop strong hand and finger muscles. Each player steps up to his partner. The right little toe of one player’s foot is placed next to his partner’s right little toe. During the game the left foot may move, but the right foot must stay in this position. Each player holds out his right hand with the index finger straight out. His thumb should be flat on the palm. His other three fingers hold down the thumb. His index finger is then curved around the other player’s like a hook. Players could also use other fingers of their right hands. They must be sure that the rest of the fingers are flat against the palm of the hand. Each player pulls his hooked finger back slowly. Players are not allowed to jerk suddenly. The referee should encourage the contestants by calling, “Huki! Huki!” (pull! pull!) as the players strain for victory. The one who can make the other player’s finger straighten wins a point. If a player moves his right foot out of position, he loses. This game can also be played so that the winner is the person who first makes ten points. Both children and adults played this game in old Hawaii. Good players learn to watch faces and motions very carefully. A no'a or stone, about the size of a quarter. A mile, or stick, to use for pointing. You can tie a piece of kapa or a piece of ti leaf to the end of a stick. This will make it look like the pointing stick the Hawaiians used. Pieces of kapa or cloth the size of a large handkerchief. If ten people are going to play, you will need five pieces of cloth. You need the same number of pieces of cloth as there are players on one team. Form two teams. The people on one team sit across from the people on the other team, facing each other, about three feet apart. Put the five pieces of cloth on the floor between the two teams. The person to hide the stone holds it in his hand so that no me can see it. Then he lifts the edge of one of the pieces of cloth and puts his hand under it. He does this with each piece of cloth. He drops the stone under one of the pieces of cloth, but he tries hard not to let the people on the other team know which cloth has the stone under it. The team that is watching will guess which cloth has the stone under it. 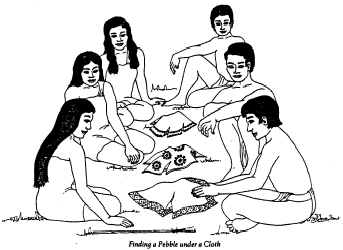 When the members of that team have decided Which cloth the stone is under, they point to that cloth with the pointing stick. The watching team watches very carefully. That team might look at the face of the person who is hiding the stone, or watch his arm, or watch for other clues that might tell where the stone is. The person who is hiding the stone tries to fool the other team and not let those players know where the stone is. Each team takes turns hiding the stone until one team has found it ten times. Every time a team guesses where the stone is, that team gets a point. The first team to get ten points wins. Another way to win is to get a point every time a team points to a cloth without the stone under it. The first team to get ten points wins the game. This ancient Hawaiian game is played similar to horseshoes. Set up a small stick post in the ground. Each person chooses a stone and tosses it at the post. The player who’s stone stops closest to the stick wins! See which "warriors" can toss their spear or darts and hit a watermelon target. Warriors have contests to see how many spears (pool noodles) each can toss into the pool of fish (hula hoop) accurately. Obviously the warrior with the most hits wins. Players sit in a circle with one player holding the coconut. The music begins and the coconut is passed around the circle until the music is stopped. The player holding the coconut when the music is stopped is out. continues until there is only one player left. Music to play (preferably Hawaiian). Lay out one less beach towel/mat than you have players/beach walkers. Have the beach walkers walk in a circle around the towels/mats when the music plays. When the music is turned off the beach walkers must stand on a towel/mat. The beach walker who does not make it to a towel/mat is out until the next game. Remove another towel/mat and start the music again. Ancient Hawaiians used to hold foot races to see which warrior was the fastest. You can hold single person races, three legged races, and backwards running races. Fill the squares on the board with game pieces, alternating colors. Remove one white and one black piece from the center of the board. Decide who will play white and who will play black. Black goes first, jumping a white piece and removing it from the board. Players take turns jumping and removing pieces. Each jump must be made over only one stone at a time. A player may capture more than one stone at a turn. Players may jump forward or backward, left or right, but not diagonally. They cannot change direction in any given turn. The game is over when neither player can move. The winner of the game can be either the player who made the last move or the one who captures the most pieces. Pick someone to be the move caller- Kimo. This game is played like "Simon Says". When the caller calls out "Kimo says" and a hula move with a description then everyone should do the hula move. If the caller does not say "Kimo says" before the move then anyone who does the move must sit out until the next game. The game continues until only one person remains. Ami: Right - rotate hips counterclockwise, one rotation for each count. Ami Left - rotate hips clockwise. Bent knees make the 'ami easier. Hela: Point right foot forward, bring back, then point left foot forward, then bring back. Kaholo:A kaholo is more of a sliding step, rather than lifting the foot as you move. It is used to step side-to-side, front to back, and diagonally. Ka'o: Sway hips by shifting weight to the right side and lift left heel. Then shift weight to the left side and lift right heel. Singing or Story Telling Hand Movement: hand gracefully gesturing at mouth for song • Swaying Palms Hand Movement: left arm becomes the land, right arm and fingers sway showing a waving palm. Each team lines up in a row. Place chairs a reasonable running distance in front of each team or any distance your space will allow. The objects listed above are placed into the beach bags and located with each team. The first players on each team, put on ALL of the items, run to the chair, return to their team, remove the items, and pass the bag to the next player. The next players continue until the entire team has had a turn. Play as you would "hot potato", using a whole coconut. Pass the coconut around the circle from person to person quickly, while music is playing. When the music stops, the person holding the coconut sits in the middle or controls the music for one round. Draw a palm tree about 4 ft. tall on the brown paper. Use green construction paper or poster board to make palm leaves. Use brown felt circles for coconuts. Blindfold each boy and see whose coconut makes it to the tree! Materials found at the U. S. Scouting Service Project, Inc. Website (C)1997-2006 may be reproduced and used locally by Scouting volunteers for training purposes consistent with the programs of the Boy Scouts of America (BSA) or other Scouting and Guiding Organizations. No material found here may be used or reproduced for electronic redistribution or for commercial or other non-Scouting purposes without the express permission of the U. S. Scouting Service Project, Inc. (USSSP) or other copyright holders. USSSP is not affiliated with BSA and does not speak on behalf of BSA. Opinions expressed on these web pages are those of the web authors.